Ouch! Right? But the cost doesn’t stop here! Don’t forget packing. I buy my boxes in bulk from ULine. My favorite sized horse box is S – 4892. The dimensions are 16 x 14 x 6. This is the MAX allowable size of 36″ or 1 cubic foot for Priority Mail before incurring huge dimensional surcharges. The cost for such a box is $1.22 with a minimum order of 25. This does not include shipping which is quite hefty so let’s say $2 a box with shipping and tax delivered to your door. And then there is the actual packaging like bubble wrap and popcorn and tape. The cost of (1) 7cu ft. bag of popcorn from ULine is $19 unshipped. The cost of (1) 12″ x 750′ roll of bubble wrap is $54 a roll unshipped. The tape is only a couple bucks a roll but all this really adds up. And that doesn’t even include the paper or the ink for printing labels and invoices. I have found buyers like shipping to be rolled into the price of the horse. I try to do this with around half of my listings but can you see how hard this can be with oh say, the cost of shipping?! I do my best to cut the cost of shipping both for myself and for my customers. Firstly, I print my labels myself and this gives a bit of a discounted rate. Anyone can do this from the website usps.com. Secondly, I horde boxes and packing. Because of this, I no longer have a usable garage. Really! Honest, it’s stuffed full of horses and boxes. 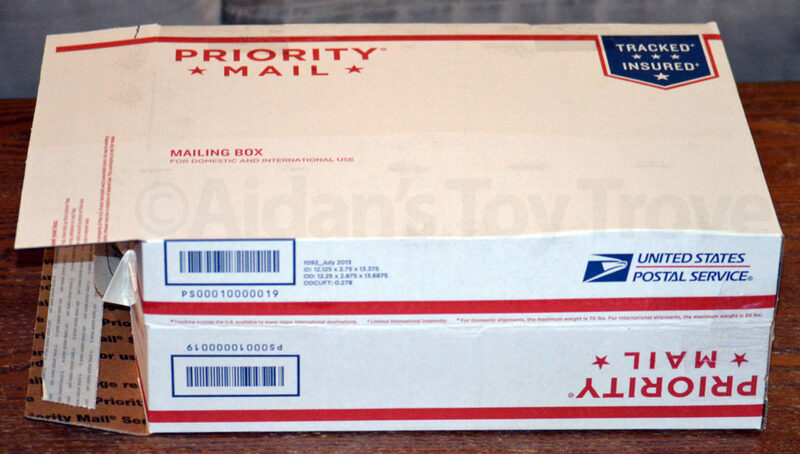 Third, I have begun to take advantage of the FREE Priority boxes that you can get from the post office. I used to steer away from these boxes. I found them to be horrible sizes for Breyers. The Priority Box 7 is 12″ x 12″ x 8″ and was too short in length for anything but standing horses. The Priority Box 1095 is 15.25″ x 12″ x 3″ and was too thin in width to accommodate anything but the skinniest of horses, Khemosabi anyone?! But you know what I learned? 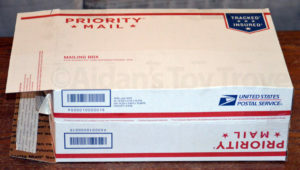 You can reshape Priority boxes as long as you still ship them by Priority Mail. Sooo…the Priority Box 1095 has become my new best friend. It can be reshaped to fit a variety of boxed and unboxed Breyer horses. Dear hubby has been resizing these boxes to help me with my Ebay shipments but I found that I needed one tonight and he was working. I present to you, my very first, made by myself, FRANKEN BOX!